A certain man now was rich and he used clothing himself in purple and fine linen, from day to day enjoying a wonderful life. A certain poor man named Lazarus, who was covered with sores, was usually laid down at his gate, and desired to be satisfied with the things that fell from the rich man's table; but also the dogs came and licked his ulcers regularly ( Luke 16:19-21). In these terms the parable starts to be known as the Rich man and the poor Lazarus. The immediate cause for Mashiach Yeshua to pronounce that parable was the haughty attitude of the majority of the Pharisees. Directly before Yeshua had let them know that they could not serve YHWH Elohim and at the same time the Mammon. To those Pharisees that was a ridiculous idea. Rather, they saw wealth as a blessing from heaven, a reward for a virtuous life. Could it not be read in the Torah that YHWH Elohim favours people like them, especially in the portion Dt 28:1-12? And did not people just look at them with respect, because they excelled in the strict observance of the Law? But Yeshua knew better; they might then declare themselves righteous, God knew their innermost; their religious pride and hypocrisy was an abomination to him. However, Yeshua, all the things that were just previously discussed by him, he now illustrates in the parable and therefore not too difficult to interpret: The Rich man clearly represents the religious Jewish upper class. Lazarus, that poor wretch, the common people. In their (supposed) privileged position with God, the Rich man did not at all hesitate to go richly dressed, in royal style [purple], convinced of their own justice [fine linen], living in abundance, yes, for themselves and their friends even wasteful. Everything that the Rich possesses, he uses for selfish and present pleasure, a hedonist therefore in heart and soul. The essence of God's kingdom - in which he naturally assigns himself a place - in reality, means nothing to him. The Lazarus' people, on the other hand, are dying of hunger - literally, but above all, spiritually. They think that their spiritual need can only be satisfied in the presence of their priests, Levites and lawyers. But nothing is less true. As the am ha-arets, the common people - literally the people of the land - they are treated with contempt by those religious leaders ( Lev 20: 2 ; Jn 7:49 ). They see them as God-tormented, spiritually beaten people [covered with sores]. Compare Dt 28 : 35 . The dogs [Gentiles], who, while competing with Lazarus in getting hold of some leftover food, are still favorable to them. They at least still lick their ulcers. It is striking that only the poor is mentioned by his name: Lazarus, the Greek form of the Hebrew Eleazar. The first Eleazar mentioned in the Bible [God helps] was one of the four sons of Aaron. He and his brothers were installed in the priesthood shortly after the establishment of the Tabernacle. He and Ithamar continued to exercise that office even after YHWH Elohim killed their brothers Nadab and Abihu. When Aaron died by the end of the Exodus, Eleazar succeeded him as High Priest. He was therefore the first on duty High Priest in the Promised Land. The numerical value of Eleazar is 308. The same value also has the Hebrew verb to repent or repent ( שוב ). In the parable, therefore, Lazarus can very well represent that part of Israel that responds to the call: Repent because the kingdom of heaven is at hand (Mt 4:17, Lk 3:3). The fact that the name of the Rich is not mentioned at all clearly indicates that he is not worthy to be kept in God's memory and must therefore be given up to oblivion. Compare Ex 32 : 33 . It happened now that the Beggar died and that he was carried away by the angels to the bosom of Abraham. De Rich man died as well and he was buried (verse 22). Jesus continues the parable now entirely in accordance with the way the Pharisees thought about death at that time. Thus they held the view that the spirit of a righteous one was transferred to heaven by angels at his death. Here Jesus says that Lazarus was carried away to the bosom of Abraham .This is reminiscent of the practice of sitting at meals, where a person's head, when he leaned backwards, came to rest almost on the bosom of the person next to him, something that indicated an intimate bond of friendship. Compare Jn 13: 23-25. Also of the Logos is said to be in the bosom of the Father ( Jn 1:18 ). The Jews did not doubt that Abraham was in paradise. To say that Lazarus was transferred to Abraham's bosom, therefore, for Jewish listeners meant that he had been led into heaven by the angels. Those who are still alive, at least know that they must die, but the dead know nothing ... Do what your hand finds to do. Do it with full dedication, for there are no actions and thoughts, no knowledge and no wisdom in the realm of the dead [Sheol (Heb); Hades (Gr)]. While those patriarchs are still dead in their grave [Sheol / Hades], God sees them, looking to the future, already as living. See also the commentary at Lk 13:28-30. And having lifted up his eyes in the Hades, while being in torments, he saw Abraham afar off, and Lazarus in his bosom (verse 23). Here too Jesus speaks entirely according to the Pharisees' thinking. From the commentary on the previous verse it may be clear to everyone that Hades, the Greek equivalent for the Hebrew Sheol, is a place of death: The grave, where the deceased - whom God keeps in his memory - are waiting for a resurrection; the place where Job wanted to be kept hidden until that time ( Job 14:13 ). Compare Ps 16:10 with Hn 2 : 27, and see Nm 16:33; Ps 6: 6 ; Is 38:18 . Especially Psalm 6: 6 is revealing: For in death there is no remembrance of you; who would praise you in the realm of the dead [sjeool]? Because the realm of the dead [Sheol] will not praise you, death does not praise you; those who descend in the pit will not hope for your truth. But the Jewish, religious elite who had been able to know these truths very well, held a different, non-Scriptural view. Now, as far as the Pharisees are concerned ... They also believe that souls have an immortal power in them and that there will be punishments or rewards under the earth, according to whether they have lived virtuously or maliciously in this life; and the latter are locked up in prison forever, but that the former will have the power to revive and live again. Another absurdity: When the Rich man in the grave, under the ground, lifts up his eyes, he can see - albeit from afar - Abraham, who is in heaven, and Lazarus in close relationship with him, as it were resting on his bosom [or: breasts, because κολπος is in the plural]. However, also that image Yeshua borrowed from the views of his contemporaries, infected as they were by Babylonian ideas: Those who were in paradise could see those who stayed in the Gehenna. The question remains, therefore, which truths Jesus really wanted to convey to his audience with these images. Well, when someone dies, that represents the greatest possible change in his life. So when both Lazarus and the Rich man died, a completely new situation started for both, especially in a religious sense. Those of the common people who acknowledged Yeshua in faith as their Messiah, responding to his call to repentance, therefore showed that they had the same faith as that of Abraham. Consequently, they were henceforth considered by God to be Abraham's true children, his seed, and therefore heirs of the promise contained in God's covenant with that patriarch: In your seed all Gentiles will be blessed. The fact that they are transferred to Abraham's bosom by the angels, apparently symbolically indicates that the angels also play an important role in drawing people to Yeshua through the gospel proclamation. Compare Jh 6: 44-45, 65; Hb 1:14; Rev 14:6-7. The situation of the Rich man is also becoming radically different. The Pharisees who always took it for granted that they, the hasidim [pious], were Abraham's real children, discover - at the latest in the 70th Year Week for Israel - that they are ultimately excluded from that privilege. And that is obviously a very painful experience for them. In the period that started with the outpouring of the holy spirit on the Lazarus' people, they experienced that exclusion with gnashing teeth ( Lk 13: 25-28 ; Acts 4: 1-2; 7: 51-54 ). 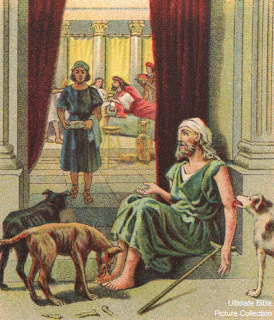 Thus, while the "Lazarus" members of the Israel of God are "dying" with regard to their previously mentally inferior condition and being transferred into a situation of extraordinary favour - where they are openly recognized by God as the true relatives of Abraham with all the promises associated with them - the Rich man class, on the other hand, ‘dies’ precisely with regard to his former privileged position when attributing primarily that divine favour to himself ( Mt 3: 7-10 ; Jh 8: 33-40 ). Instead, he finds himself in a situation of divine rejection. Because of their stubborn disbelief and enmity towards the Messiah, those prominent religious leaders deny that they are Abraham's true children. Not Abraham is their father but the Devil ( Jn 8: 40-44, Mt 23: 29-33 ). And he, raising up the voice, said, Father Abraham, have mercy on me, and send Lazarus, that he might dip the tip of his finger in water, and cool my tongue, for I suffer pain in this flame (verse 24). It is striking that YHWH Elohim, Israel's Holy One, remains in the background in the scene of the parable. It turns out in particular that the person of 'Abraham' highlights the issues related to the ‘case’ of the true Israel and the identity of her members. And not incomprehensible, since God has fully connected his purpose - to bless mankind through the kingdom of his Son, the Messiah - with that man of faith and with his "seed," of whom Yeshua is the most important (Gal 3:7- 9, 14-16, 26-29). However, in the conversation that now arises between the Rich man and 'Abraham', we hear YHWH speaking, of course through the latter. And 'Abraham' judges severely about the Rich man. Why? In the introduction to this parable, Yeshua told the Pharisees that it is not possible to serve two Lords at the same time: God and the Mammon. And also that only fornication is a valid reason to dissolve a marriage and remarry (Lk 16:13, 18). Having made the Mammon their god, they commit spiritual adultery to their God YHWH, with whom Israel entered into a marriage covenant at Sinai( Eze 16: 8-14; Hs 1: 2). On the basis of spiritual fornication he is therefore entitled to divorce her and to break his covenant with his wife's nation. After all, She was the first to violate the marriage covenant (Jr 31: 31-32, Ez 16:59). Not just because YHWH sees something unpalatable with them [Dt 24: 1], but on the basis of committed sexual fornication. Unfairly, then, the Rich man addresses Abraham confidently as Father, as if the relationship is still good and rights can be derived from it; as if he still represents the true Israel. He asks for compassion for his painful situation: If 'Lazarus' could be sent with a drop of water on the tip of his finger to cool his tongue. Incidentally, the Rich man still sees Lazarus as a subordinate, a servant who must help him; not as an equal. And further: whether a drop of water on his fingertip can also offer some relief for the pains of the Rich man! But this is also parable language. Without imagery: The Pharisees wish that they themselves be spared! They like to see the divine message - in which they are denounced - is being watered down. How does 'Abraham' think about that issue? But Abraham said, Child, remember that you have received in full your good things in your lifetime, and Lazarus likewise the bad ones. Now, however, he is being comforted here, but you are being pained. And besides all these things, there is a great chasm between us and you people, so that those who want to move from here to you cannot. Neither can they cross over from there to us (vv 25-26). a. It is not spiritually safe for 'Lazarus' outside of Abraham's bosom. b. The decision that God has taken with regard to both is entirely justified. c. The gap between the two is unbridgeable. By addressing him with child, "Abraham" recognizes that the Rich man is a natural descendant of him. From that point of view he would naturally be willing to offer help, but he can not change God's righteous counsel, namely that not all who belong to Israel are also true Israel. Nor are they automatically Abraham's true children, merely because they are his natural seed, offspring according to the flesh. Not the children according to the flesh are counted as God's children, but those who are counted as belonging to the promise; those who, on the basis of his merciful election, are counted as Abraham's seed (Rom 9:6-12). The Rich man has been given sufficient opportunity by God to lead his own 'happy' life. He can only blame himself that his interest only went to the pleasures the Mammon offered him. Thus he made himself unfit for the exercise of any divine task during the Messianic age. His management of the unjust Mammon was exclusively hedonistic; for the poor spiritual situation of 'Lazarus' he had no eye at all. Consequently, he also did not make friends in the heavenly spheres. When the spirit was poured out on the humble Lazarus class at Pentecost, he, the Rich man, stood gnashing at the sidelines. The spiritual gap between the two is immense. Fundamentalism, legalism, sectarianism on the one hand and the Israel of God on the other hand are irreconcilably far apart. But he said: In that event I ask you, Father, that you send him to my father's house, for I have five brothers, in order that he may give them a thorough testimony, that they too may not come into this place of torment (v. 27-28). The Rich man makes another attempt to remove 'Lazarus' from Abraham’s bossom. He has so-called compassion for his fellow believers, his five brothers in his father's sectarian house. The number five here refers to a part of Israel to the flesh, as is the case with the five foolish virgins. There is a lot of agreement between them and the Rich Man: Because of unbelief, their Messianic expectations are wrongly directed. At the decisive moment they experience rejection and exclusion. See: 2Kn 7:13; Mt 25: 1-3, 10-12. Incidentally, from the book of Acts we learn that, from Pentecost, the thoroughly given testimony by Yeshua's disciples did not change the mood of the religious elite. On the contrary, they kept showing themselves as opponents of the Messiah and as the most hostile persecutors of his disciples (Acts 5:17-33, 1Thess 2:14-16). However, Abraham said: They have Moses and the Prophets; let them listen to them. But he said: No, father Abraham, but if someone from the dead would go to them, they will come to repentance. However, he said to him: If they do not listen to Moses and the Prophets, neither they will let themselves be persuaded if someone rises from the dead (vv 29-31). After his resurrection, Yeshua would declare to the two disciples at Emmaus that in the Scriptures of Moses and all the Prophets so many things had been written down beforehand about him, the Messiah, that there were plenty of reasons for the Jewish readers to believe in him if they were only willing to open their hearts to it (Lk 24:25-26). And that is also exactly what the Rich man gets to hear from 'Abraham'. This means that the stubborn disbelief of the Jews over the centuries in relation to Yeshua, Israel's true Messiah, is culpable. And that all the more because since then the Gospels and the Jewish-Christian books of Hebrews up to and including the Revelation, have been added to the canon of the Bible. Because of their hardening, YHWH Elohim has rightly locked them up in disobedience. As is the case with the older son in the parable of The Prodigal Son, the Rich man with his five brothers stands outside the door of the fatherly house. Compare Luke 15:28-32 and Rom 11:31-32. In his excluded situation, the Rich man even dares to contradict! Incredible Jewish hubris at the top! He realizes then too well that his five brothers are of the same kind as he is, not willing to see Yeshua in the light of their holy Scriptures. Moreover, they have increasingly taken away the divine power from those inspired writings. Not only by adding their own fantastic inventions, but also by showing more trust in their own human traditions than in the inspired Word of God. In the rabbinic schools, the Yeshivas, the study of Scripture has more or less been replaced by Talmud study. According to the Rich man, something big is needed, a miracle; someone who has risen from the dead must go to them. However, with his foresight, 'Abraham' knows that that will not work either. And history has put him in the right: When Yeshua rose from the dead on the third day, that great event did not change their unbelief. In their deep hatred they even made attempts to erase the evidence of his resurrection (Mt 28:11-15). Something similar happened before when a man with the same name, Lazarus, the brother of Martha and Mary, was raised. Some Jews who witnessed that scene then went to the Pharisees to inform them of the miracle. Their reaction? The chief priests and Pharisees were deliberating not only to kill Yeshua, but also Lazarus, because many Jews believed in Yeshua because of him (John 11:45-53, 12:9-11). And also at the beginning of Yeshua's presence, when his own congregation, his Congregational Body, is raptured from the earthly stage, largely by resurrection, but partly also by the change of the remaining members to the spiritual nature, this will not affect the majority of the Jews. They will identify themselves with the false Messiah, the Antichrist, and hail him as their long-expected 'Messiah'. Only a Remnant will "return” (Isaiah 10:20-22). These verses also draw our attention to the fact that it is unrealistic to think that signs and wonders will in themselves incite people to believe in the Messiah. The Scriptures themselves indicate that hardened hearts will not respond to him. In that sense, the Word of God as witness has much more persuasion than any wondrous incident. That is why Scripture has been the main instrument of the spirit throughout the entire Age of the Church to bring people to repentance. Compare John 16:7-15.